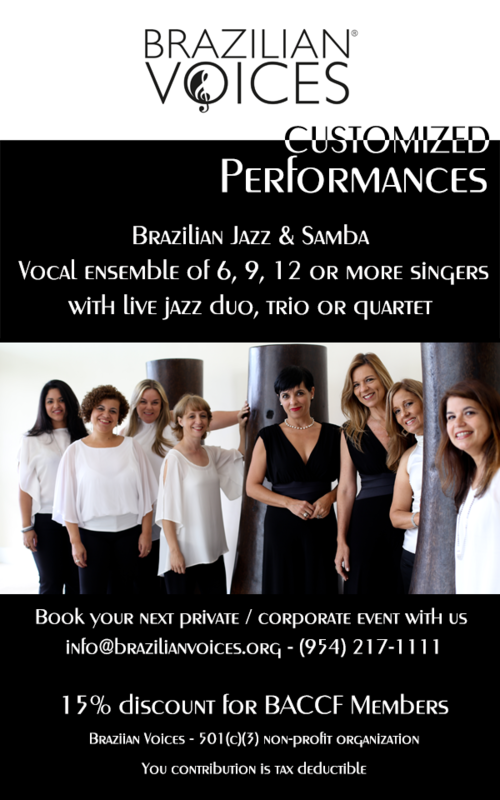 Brazilian Voices, a non-profit organization and women's vocal ensemble, is offering a 15% discount on Customized Performances for all BACCF Members! For decades, Bossa Nova has been the musical genre of choice in sophisticated entertainment venues. The combination of a smooth rhythm, rich harmonies, and calm melodies makes Bossa Nova the perfect type of music to listen to during social meetings and private events such as weddings, engagement parties, and conferences. Brazilian Voices offers flexible configurations from the original group of more than 40 singers to smaller ensembles according to the type of event, venue, or budget. Performances are tailor-planned according to the desire of the customer, size, and characteristics of the venue, allowing for a full enjoyment of this award-winning vocal group. With a Brazilian Voices Customized Performance, you will be supporting a local arts organization and the Brazilian community while enjoying live Bossa Nova and Samba at your next private or corporate event! Call or email to book your next Customized Performance.